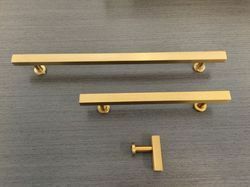 We are decorative Dore brass handle plate and pull handle. We are manufacturer and exporter of high quality brass handle and offer this product as per client requirments and this product made by our expert with great quality and i am looking for bulk order with foreign query. Brass Gold Plated Handle 14"